Raise awareness of the achievements of accomplished African Americans in their local communities. Encourage student achievement, parental involvement, increased test scores, high school graduation rates, and successful college entry and matriculation. Bring African American leaders into schools to engage with the community and motivate students directly. Provide clear, culturally relevant examples of role models and career pathways for students. Encourage use of The HistoryMakers Digital Archive of oral history interviews. Back To School With The HistoryMakers has featured HistoryMakers like former senior presidential advisor Valerie Jarrett, former Mayor of Philadelphia The Honorable W. Wilson Goode, renowned opera singer Denyce Graves, and NASA’s Glenn Research Center Director, Julian Manly Earls, among hundreds of others, visiting schools in their local communities. 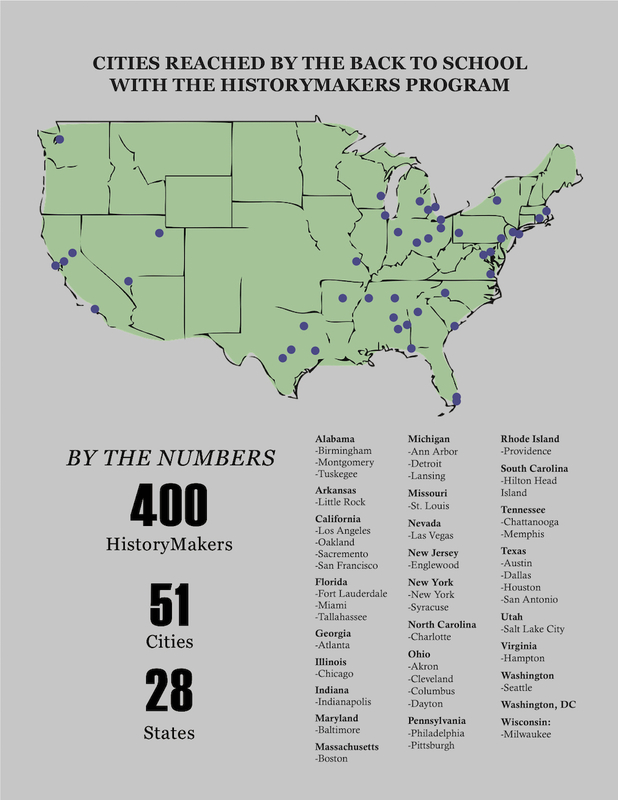 In most cases, educators and administrators at the schools who participate in the Back To School With The HistoryMakers program do not have the ability to reach out and contact the broad array of demographics and socioeconomic levels represented by the individuals interviewed for The HistoryMakers Collection. Through this program, students are able to draw concrete parallels with their own lives, and are inspired to explore more varied opportunities for their education and career. Due to calls for increased engagement from participating schools, the popular Back To School program was expanded into February with Black History Month Speak Out! Assemblies, as a means of fostering longer and deeper interaction between HistoryMakers and students. In this program, students research visiting HistoryMakers and prepare questions before the program for a student representative to then use to interview the HistoryMaker before a school audience. In its first year, the Speak Out! Assemblies took place in 33 schools, 17 cities, and 14 states. Hospitality High School of Washington, D.C.